Suzannah Ashley: An almost tragedy! I'm still here, I've just been a bit busy. I'm participating in a few craft swaps, which I'll show my work from once they are received by my partners. All are Halloween Swaps. One is through Craftster, and its pretty open-ended as far as what to craft, so I've tried to focus on new things to experiment with. The other 2 are through Swap-Bot. These are both Halloween Stuffie swaps. YAY! Something that has caused a major interruption in my crafting has been a pretty upsetting accident. Because I have cats (4 cats), I try to be vigilant about not leaving lengths of threads around for them to eat since it is dangerous for them. I keep only a small bit of thread through needles, just so I can see them easily. While working on one of my swap items, I left the table for a moment to cut up some delicious fruits to munch on. I thought I put my needle with its 2 inches of neon green floss back into my pin cushion, though I can't be positive. I was keeping an eye on the table that I was working on, or so I thought. I got back to the table, no more than 5 minutes after getting up, and went to grab my needle so I could thread it and continue working. But what's this, no needle. I instantly panic, thinking that if the needle fell on the floor, it could easily get stuck in a kitty paw. After 10 minutes of frantic searching, coming up empty handed I began to cry, and called for my boyfriend to come help. Two hours later, searching every single piece of anything I had out, and still no needle. Even after vacuuming the entire area, and using my boyfriend's super magnets to try and draw it out of its hiding place. At this point I was pretty convinced that one of the cats had eaten it. I called my vet's office, which has an on-call vet, and explained my situation. We decided that since I didn't actually SEE anyone eat the needle, and all the cats were behaving normally, to wait until morning and see if something should be done. 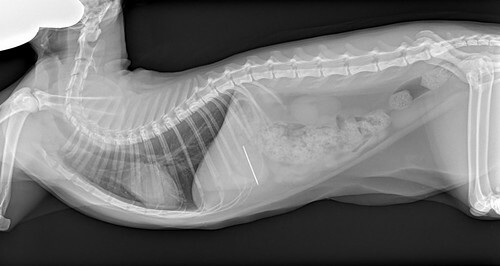 The next morning we get a call from the vet's office, and I'm really set on taking all the cats in to get xrays. I only have 2 carriers, so I could only take 2 at a time. I decide to take Wolfgang and Duff first since when I came back to the table they were underneath it. 2 of the 4 cats had their annual checkups scheduled for a few days later anyway, so we were going to knock those out too. They x-rayed Wolfie and Duff, no needle, but Wolfie did get a clean bill of health (though he is a little chubby) and his vaccine booster. I brought them back home, loaded up Spooky and Uma, and headed back. As they are checking out Spooky for his annual check up, the tech comes back in. Spooky won't be needing x-rays, because Uma was the needle eater! For those who don't know, Uma is my youngest, and smallest cat. She's super petite, so the needle was as long as her face. Also, that very morning she was doing her typical somersaults, which is one of her specialties. Even though I had a pretty good idea that one of the cats had eaten it, I was still shocked. Especially seeing the x-ray. Also, I didn't even see her near the table. Though I should know better since she is the sneakiest and fastest of my kitties. She is a super ninja. Next thing I know I'm signing surgery consent forms, and heading back home with one less kitty than I came in with. I was in a daze from the moment they told me, to later when I got a call that she made it through surgery. It had moved to her small intestine by the time they got in there, but she seemed to be doing ok, and if she made it through the next 4-5 days she should be fine. Well its 4 days later, and Uma acts like nothing is wrong. 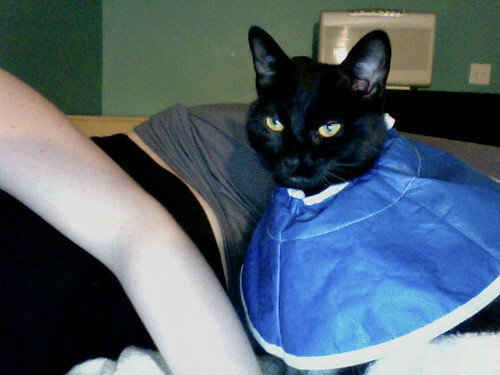 Other than disliking to take her post op meds and the collar she has to wear, she is happy as a clam. In fact she thinks she should be allowed to do all the things she used to do, like jump, run etc, and doesn't know why I'm not letting her. I'm keeping a very careful eye on her, and she will have a check up to make sure everything looks good in a few more days, but I am so thankful and relieved. My precious baby. I don't know how I'd have lived with myself if this had turned out worse. I've been pretty unfocused on anything other than caring for her and keeping the others out of trouble. I think my nerves are finally settling, and I'll be able to get back to my crafting projects. Next time I'm taking no chances. I'll be getting one of those wrist pin cushions, so all my sharp objects come with me wherever I go instead of tempting sneaky kittehs! I usually craft in my craft room, which I keep them out of depending on what I'm working on. Of course this was one of the few times I didn't. I never imagined one of them would eat a needle. String, sure, but I thought a needle would have caused them to yelp or cry out. Apparently Uma swallowed this thing like a pro, and it went straight into her stomach instead of getting caught in her throat, roof of mouth, etc. I'll have to check out that site. Thanks for the link! That is crazy!! I have a wrist pin cushion that I don't use - maybe I will now!! !